13 Sep 07: Added the sc4 file terrain. As some requests and in order to create a sub-neighborhood I have added the sc4 file with all its terrain images. Numenor: lot building, screenshots, translations, general helping and... ghosts performing. The Neighborhood terrain was created by Max3D. This is a very playable neighborhood: the relevant area is centered on the terrain, so to avoid camera problems; therefore, each lot is easily selectable (unlike some custom neighborhoods, that are really hard to be used, unless you have a camera hack). The goal of this project was to create a light, playable and LEGACY neighborhood complete with lots: ONLY Maxis assets, NO HACKS, NO CUSTOM CONTENT! This project was born as a "Contest", so we had to comply with the some rules, that contributed to the overall look of the neighborhood. Here is a list of all the existing lots, along with the rules that we've set for them; in the following posts, you'll find a more detailed description of each lot. Lots 1- 2 - 3 - 4 : These are 2x2 lots hosting expensive cottages (costing over 100.000 §), each adopting a unique style, but consistent to the other ones. Lot 5: A 2x3 lot hosting an expensive country historical building (not having set a cost limit, this is the most expensive lot in SimVille). Lots 6a - 6b - 6c - 8 - 9 - 10 : These are starter houses, costing less than 20.000 §. Lot 7 : This is a 2x2 decent house, costing less then 45.000 §. Lot 11 : This is an "abusive" lot! Lots A e B are the most important lots: we decided to "assign" them to the best creators (publicly elected) and to name them after the authors! In the archive G999-EMPTY.rar you'll find the neighborhood with only empty lots, without any building. Its size in byte is ridiculously low: the actual files are 784 KB only (the compressed rar is 446 KB). The overall size in bytes of the entire neighborhood is 15 MB on hard disk (the compressed rar is 7,3 MB large). IMPORTANT: You can install ONLY ONE neighborhood version: either the "Full" OR the "Empty" one! If you prefer the EMPTY version, you have to download and install the lots separately (so that you can choose which ones you want), or build your own lots in the neighborhood. The separated lots are provided in the usual Sims2pack format, and you can install them using the Clean Installer, the Maxis installer or even the Q-Xpress. Please be aware that the EMPTY version of the neighborhood does NOT contain the GHOSTS in the graveyard; you can only populate it with your own ghosts. The EP Seasons is absolutely required, or your game will crash! The other EPs are needed to get the whole neighborhood with all its decorations: without some EPs you will lose the related items (they might disappear completely, or might be replaced by other items), but the neighborhood will be playable anyway. Alternatively, if you want this to be a neighborhood, you can download also the sc4 file. 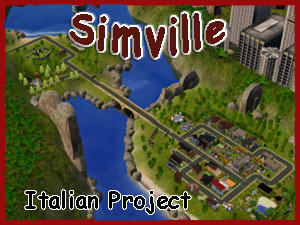 In the archive SimVille-Terrain.rar you'll find the sc4 file and ALL the image of the terrain. Extract ALL the files inside tha rar into MyDocuments/EA Games/The Sims 2/SC4terrains. Note: the terrain is totally empty, you have to add all the decorative items, also the bridge. All the lots required absolutely the EP Seasons, or your game will crash! While building our lots, we used objects and decoration from ALL the Expansion packs; we tried to completely avoid using the Stuff packs, but something from the Glamour stuff pack has been included in some lots. Again, let's clear up that if you HAVE Seasons, but you LACK one or more EP/SP, you can still play the lots; but of course they won't look like we designed them, and in some cases they could look very ugly, or lack some important elements (doors, windows...). If you are in doubt, install the various lots (or use the Full neighborhood version) and examine the lots in build mode; there are no risks whatsoever: at most the lots will look bad, and you can bulldoze them.